This is now the third session I am observing. Andy leads a physical warm up, which includes exercises ‘Stop/Go’ and ‘Pass the Clap’. I never really use ‘Pass the Clap’ when running a warm up - I don’t know why, I guess we all have games that we tend towards. The group knows this game, and it really works as a fun, simple game to raise the energy, so I will definitely start to use it with groups that I lead. We are developing the work we did on story telling from previous weeks. Andy runs an exercise called ‘statues’, here one partner is the ‘sculptor’ and the other is the ‘piece of clay’. The sculptor gently moulds her or his partner into a statue. The word Andy gives us to inspire these statues is ‘ecstatic’. I have run this game in the past as a way of exploring a group’s initial response to a theme but the actual stimulus word here is less important; Andy wants us to examine the sculpting process. Now both partners know the final position to end up in, we are to replay the sculpting process, but with the sculptor more as a ‘puppeteer’. She or he is controlling the situation, perhaps with imaginary strings pulling the statue into place without touching it. This yields some interesting and mesmerising results from the group. We then have another go at this, and the partner who is the ‘clay’ can either cooperate with the puppeteer, or try and resist being put into this image. The group create some very fascinating sequences in response to this, with some pairs ending up with quite a comic routine and others with something that feels much darker. I have never seen this exercise run like this before, and I realise what Andy has done is rework it to explore the idea of the storyteller and how she or he manipulates the story. It also demonstrates how you can create a dynamic between the storyteller(s) and the other performers, who may or may not wish to cooperate with the storyteller. 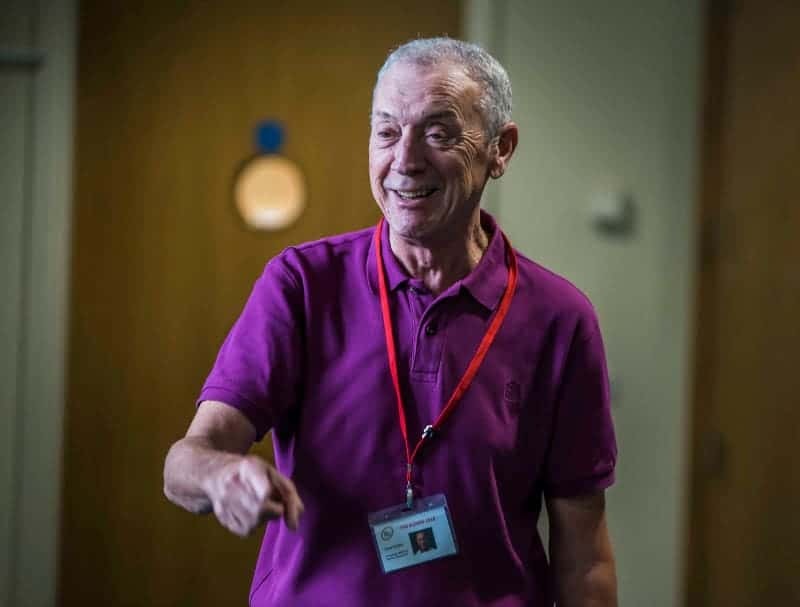 Before the break, Andy shares some text from a script with us from when he did his own storytelling performance in schools a couple of years ago. It shows us how with a small cast each performer can have several parts as well as playing the storyteller. A dynamic can exist between all these characters and this can be captured, for example, in the way the performer transitions between their roles. We finish the session with some group work, choosing a well-known story and applying what we have learnt so far as we devise an opening. At the end of the workshop, Andy announces that there are only two more sessions of the term left and we will be focusing more on group devising during these final two sessions. There are several strands of the Elders programme and it has taken me some time to fully understand how it all works. I thought it might be useful to explain this in one of my blogs, because as far as I know the format of the Elders programme is quite unique to the Exchange. The sessions I am observing, officially called ‘Elders Company’ runs for eight weeks three times a year. Members are invited to join the company (it is normally very popular), but choose two of the three terms to participate in. This ensures there is some turn-over and fresh faces each year.  Each term focuses on one element of theatre practice (currently storytelling, next term, Stanislavski), and there is not normally a performance outcome at the end of these sessions - the idea is to develop the group’s theatre making skills. Alongside these sessions, there is Elders Monthly which is open to all members of the public over 60 and tickets for this can be purchased at the Box Office. These give a chance to try out the Elders sessions and can be a route to joining the company, or simply a way of dipping into the work without committing to the weekly sessions. In addition to all this work, there are shows that are rehearsed separately, cast from the current Elders Company, although not necessarily involving the whole company. I hope that helps for anybody out there wondering exactly how the Exchange has chosen to organise their offer for older people. And if you want to find out more about what we do in the final two sessions of the term, please stay tuned! 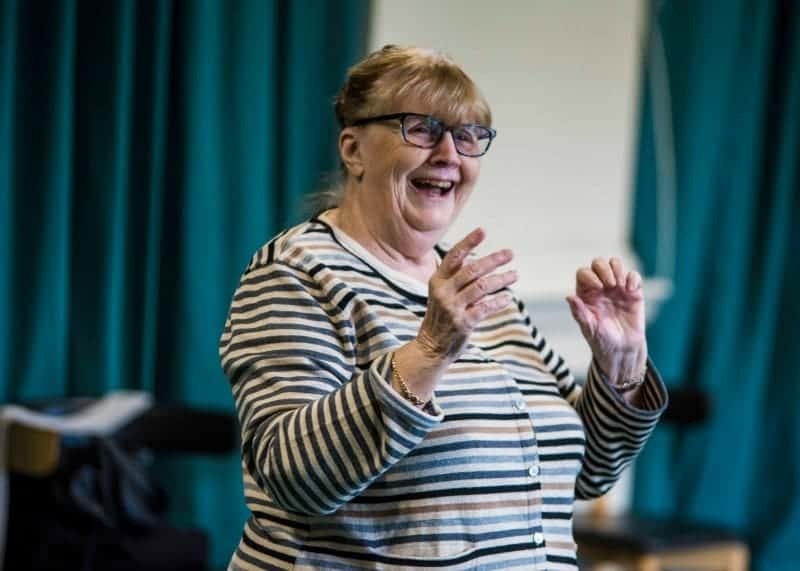 Elders Company is for everyone aged 60+ who wants to feel connected to new people and ideas, develop performance skills and make boundary-pushing theatre that challenges negative stereotypes of ageing. Observer Mondays is an Open Exchange Opportunity - sign up here for opportunities and to find out when Observer Mondays applications reopen.